The Tree Trunk of a rifle is the “stoc” or as we say today, stock. In a nutshell the stock holds the important gun parts and is placed against one’s shoulder when shooting. I think tree trunk is an apt description since until recently, gun stocks have evolved about as fast as trees. But today there is little sacred ground with rifle stocks to the point they have jumped species and the thing we used to call a stock might now be called a chassis and could be confused for an alien visiting from another planet. I decided I was done with wood stocks back in the 1980s and have never looked back. Sure I enjoy the beauty of a artistically carved and finished gunstock, but for real world applications in my life, tree trunks are out. So with my loyalty to the woodstock in the rear view mirror, I am quick to adopt new designs and new technology especially when it comes to interface points between me and the machine. So optics, triggers and stocks are are always on my radar. Few companies in the history of the world have revolutionized the rifle stock as fast Magpul. And given that the stock has been referred to as such since 1571, Magpul’s ability to shake up an almost 450 year old technology really says something. Of course, others have dabbled in the buttstock but none with the same vim and vigor as Magpul and its polymer wizards. Beginning with the AR-15 platform, Magpul quickly diversified our appreciation for choice and customization. And then just as fast, Magpul moved beyond the AR and just recently entered the glorious 10/22 marketplace. 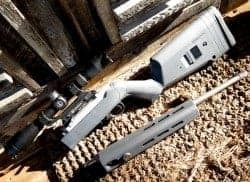 Magpul’s first 10/22 stock was the Hunter X-22. An overbuilt chassis with fabulous ergonomics and features. Frankly, my first thought when I held an X-22 Hunter was that Magpul cares more about the 10/22 than Ruger does. My feeling was an outgrowth of something I’ve noticed in the past, and that is that often aftermarket builders of gun parts put quality into their designs proportional to the initial cost of a gun or by its cartridge. And thus the lowly .22 Long Rifle was not worth a full-on stock. Just plastics, lookalikes, and underbuilt experiments. Sure, some were much better than others, but it seemed any major upgrade in .22 stock was as special order. Compared to the base model Ruger 10/22 Takedown’s black plastic factory stock, the Magpul takes all of the “toy” feel out of original and moves the gun into a whole new rifle experience. There are two primary pieces to a takedown stock, the buttstock with grip and the forend which in the case of the Magpul also contains a separate barrel tray. 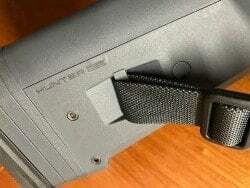 The weight of the Magpul buttstock is 29.6 ounces while the factory Ruger buttstock weighs 16.7. The Magpul forend weighs in at 8.6 ounces, and the factory Ruger forend is 5.7 ounces. So overall, the Magpul X-22 Hunter stock adds about one pound more than an out-of-the-box Ruger 10/22. The price in weight of the X-22 Hunter is more than made up in performance and off-hand accuracy. There are two ways to look at the 10/22 Takedown. One way leans heavily towards minimalism. And the other is to overcome the limitations or shortcomings of a light rifle that breaks in two. The Magpul X-22 Hunter Stock clearly bends towards making the 10/22 a better shooter regardless of adding some additional size and weight. But don’t fear, Magpul is working on bending the otherway as well. Stay tuned on that. The Magpul X-22 Hunter stock has an M-Lok friendly forend, and a sling-ready back stock. There are also several points to screw in Quick-Detach receptacles. To adjust the length of pull, the Magpul X-22 Hunter comes with additional buttplate spacers. Two spacers are installed at point of purchase, and two more are included in the box allowing the shooter to dial in the perfect length of pull to fit their needs. Additionally, Magpul sells cheek risers that fit the X-22 Hunter. So you can really customize this chassis for serious precision shooting and hunting. 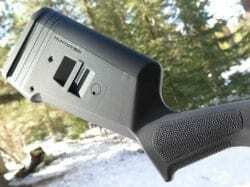 The forend of the Magpul X-22 Hunter stock has a reversible barrel tray that accommodates the so-called “pencil barrel” of base model 10/22s as well as the 0.920 diameter bull barrels. And proving that Magpul really loves us, adjustable shims are included that allow the shooter to adjust the barrel harmonics through a set screw directly under the shim. To trick out my 10/22 Takedown Hunter X-22, I first swapped out some internals of Bill Ruger’s 10/22 clockwork. There are obvious upgrades that 10/22s need right out of the chute. The first is a bolt buffer pin and the second is a bolt release plate. To soften the bolt’s equal and opposite motion backward when a shot is fired, I replaced the metal pin from the Ruger factory with a TANDEMKROSS “Shock Block” Bolt Buffer. The Shock Block is a polymer cylinder that works like a drift pin, but is softer and absorbs the shock of a cycling bolt. The Shock Block also reduces the wear on the bolt from repeatedly slamming into a metal stop. I’ve struggled to insert a softer pin into the 10/22 receiver on many occasions so I usually put a mild taper onto the far end of the buffer pin, a TANDEMKROSS Shock Block in this case. To install a subtle taper on the polymer pin to aid in seating without risk of mushrooming either end, I first insert the polymer pin into the jaws of my drill’s chuck. Then I spin it with a piece of sandpaper pinched around the the tip. Ten seconds later I have just the hint of taper to make the pin behave just like a metal one. Better in fact. In order to sling-shot the bolt closed, I used the TANDEMKROSS “Guardian” Bolt Release Plate. Rather than the “tired but true” clunky bolt release plate of the factory 10/22, a quick swap of the plate makes the 10/22 behave like one would expect this far into the 21st century. Another important TANDEMKROSS upgrade I made to my X-22 Hunter 10/22 Takedown included swapping out the factory bolt for hardened tool steel CNC-machined “KrossFire Bolt. The KrossFIre is a thing of beauty and has a vertical movement restricted firing pin for more reliable and predictable .22 ignition reducing misfires. Since I was replacing the bolt, I also swapped out the small but dense factory charging handle with a longer Spartan Skeletonized Charging lever. The TANDEMKROSS Spartan is easier to grab thorough its larger and more ergonomic human interface. But the low mass of the skeletonized grip keeps the bolt cycling at the proper speed. The final receiver upgrade I made, well almost the final one, was to replace the factory bolt-on scope rail with the TANDEMKROSS “Advantage” Charging Handle and Picatinny Scope Base. 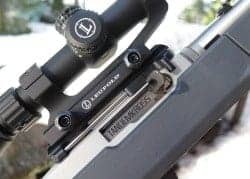 While providing a slightly elevated scope platform, the real advantage of the “Advantage” is that you can easily cycle or charge the 10/22 bolt from both the left and the right side of the rifle. 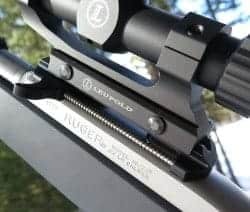 Rather than being a total rework of the bolt, the Advantage charging handle is component that engages the existing charging handle but offers an ambidextrous option. When I first saw a picture of the Advantage charging handle, I was skeptical that it would offer the fluid and smooth charging of the factory bolt. But at the 2015 SHOT Show I got some hands-on time with one and was impressed. It worked beautifully. In the field, the Ruger 10/22 Takedown with Magpul X-22 Hunter stock was like a whole new level of 10/22. The feel of the stock in hand felt so much more precise and natural compared to the classic but ancient lines of the traditional stock. The Ruger rotary magazines are legendary for their durability and reliability. But there is still some room for improvement and I thought I would take a few mag upgrades for a spin. First is a TANDEMKROSS “Companion” magazine bumper. The Ruger magazines are known are smooth and fairly featureless which makes them difficult to extract when they don’t pop out on their own. The Companion bumper adds a rigid base with wings onto the factory magazine. Another TANDEMKROSS adventure is the “Double Kross” dual magazine body. 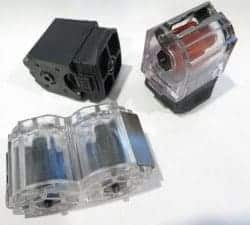 The Double Kross is a transparent housing that combines two magazines into one piece with a two 10-rounds mags 180 degrees apart but in one housing. The Double Kross works great, just like the original. However, it uses the internal parts of two existing magazines so one must swap out the guts, twice. And that is where the adventure is. If you’ve never disassembled a Ruger rotary magazine, you are in for a treat. So much so that TANDEMKROSS makes a “10/22 Rotary Magazine Tune-up Tool which I can attest is worth it’s weight in gold when the springs start flying. With all this 10/22 magazine goodness, I went ahead and installed a TANDEMKROSS “Fireswitch” extended mag release lever. Using a cantilevered design, the Fireswitch will release the magazine with either a push or a pull on the lever. The Fireswitch is also much easier to use while wearing gloves compared to the stock mag release. Ruger packaged the 10/22 Takedown with an oversized backpack. I was not thrilled with the pack, and considered it far too large for the svelte Takedown. But a 10/22 Takedown wearing the Magpul X-22 furniture fits wonderfully into the Ruger backpack. So I put it back into service again. The Ruger 10/22 Takedown is finally maturing into the rifle I knew it would be someday. But wait, there’s more. But you will have to wait. So stay tuned right here.